Confessions of a Campus Missionary: Sirak's September 2016 Update!! I hope all is well with you :) So much has gone on this past month that I am honored to update you about! First off, God is good. Second off, God is faithful. It's amazing how such a simple idea can be so easy to forget. Throughout this month I have been challenged and shaped through this truth. As I sit here typing this blog I am reminded about this truth: when you love people deeply from the heart you must also be willing to be hurt deeply from the hurt. When a student decides to reject your invitation into spiritual friendship it hurts. When a student decides to follow a life of sin and immaturity instead of following the call of Christ it is frustrating. Despite these realities of campus ministry, God calls us to be faithful. "He also said, 'This is what the kingdom of God is like. A man scatters seed on the ground. Night and day, whether he sleeps or gets up, the seed sprouts and grows, though he does not know how. All by itself the soil produces grain - first the stalk, then the head, then the full kernel in the head. As soon as the grain is ripe, he puts the sickle to it, because the harvest has come." Mark 4:26-29. This story has challenged me this month to be faithful. Being faithful can be easy when things are easy and comfortable, however, when things don't make sense or seem to be bearing fruit, being faithful can be a deep struggle. In this story of the farmer sowing seed, I am struck at his faithfulness and confidence in the process of sowing seed. "...the seed sprouts and grows, though he does not know how...". Father, I pray that you would make us all faithful like this farmer. 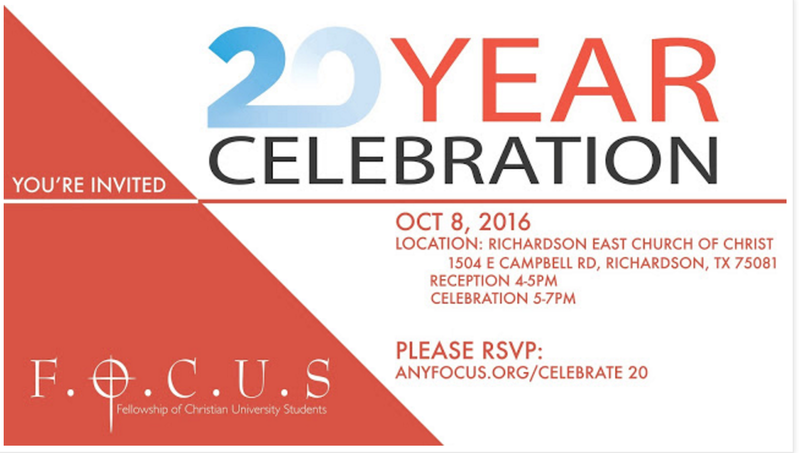 I hope to see all of you at our 20-year celebration this Saturday, Oct. 8th @ 4:00pm. (@ Richardson East Church of Christ). I cannot express how excited I am for this event! (see photo below) I'd be honored to see you all and celebrate what God has done over the last 20 years together! Thank you so much for your partnership and support :) Enjoy the (many) photos below and I pray that you're encouraged at what God is doing on his college campuses! We set up a table at the student org-fair! We got to meet so many students at Richland during welcome week. We had a lunch hangout/board game day and our students really have been doing a great job meeting new students and serving one another. I am amazed at how important community is on a college campus. For many of these students, these are the first Christian friends they've ever had! We did our first annual FOCUS Worship Conference! It was a joy to lead and share some of the insights and ideas that have challenged and shaped me over the years as a worship leader. Our UTD/Richland/TWU Dallas Fall Camp! We spent a good amount of the day Saturday getting to know one another and playing large group games. Another shot of the worship conference! Carter, (right, blue shirt), the director of the Office of Student Life, is going to be transferring to Tarrant County and he has been an instrumental part in helping us establish ourselves as an organization on campus. Before he left, he shared his heart for Richland college and his vision - he will be missed! Our 2016 Richland men's core! Our Wednesday large group meetings have been such an encouragement mid-week. We have been talking about what it means to live a life following the spirit. Shot of our worship band at fall camp 2016. We've been hard at work recording video footage for our 20-year celebration. We've got a lot of cool things planned this Saturday!